Prom night. A childhood rite of passage that many of us parents remember fondly. What’s not to like about dressing up, eating something fancy for dinner and dancing the night away with friends? 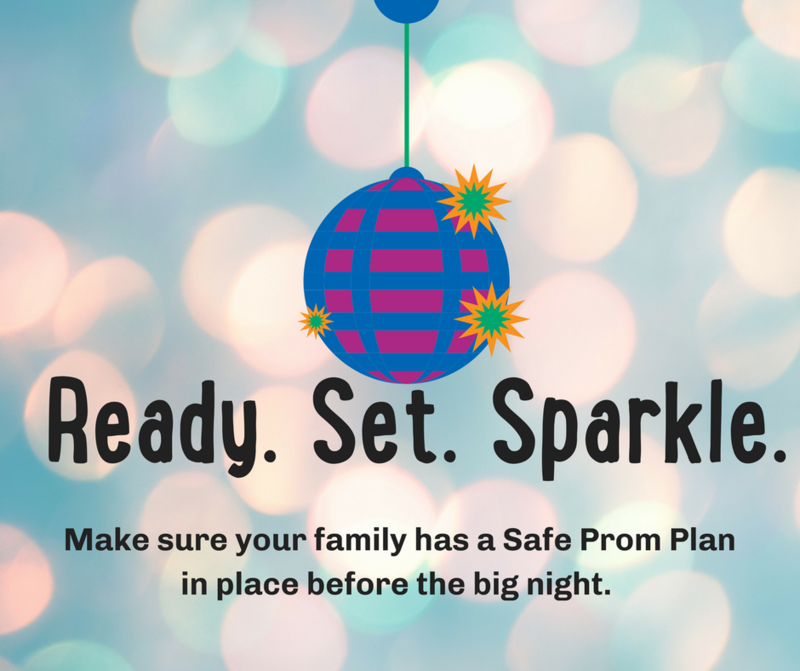 Encourage your adolescent to enjoy this exciting time and work together to make a “Safe Prom” plan with them before the big night. Research shows that more teens die from drinking and driving during prom and graduation than at any other time of year. You can have a big impact on supporting your teen in making healthy and self-respecting decisions during this high risk time. Talk about your no-use expectations with your teen. While prom night is an exceptional event, there are no exceptions for making good decisions and not drinking, using drugs, or riding in a car with anyone who is impaired. Below you’ll find a few of our favorite “Safe Prom” tips. Decide what expectations work best for your family and stick to it. If a written & signed contract is your family’s style, check out these templates on our Pinterest page. Talk to your teen about who will accompany them to prom and any after prom parties, and ensure those friends will respect your family’s no-use policy. Peer influence is a powerful force with positive and sometimes negative consequences. Talk with your teen about refusal strategies and setting healthy boundaries for themselves and respecting their friends boundaries, too. Arrange for a group of friends to share the cost of a limo. Check in with the driver to make sure they understand your no-use policy, verify that no alcoholic beverages are in the limo already, and tell the driver not to make any unplanned stops. If a limo isn’t your kids thing, find a trust-worthy chauffeur for the evening. An older sibling, relative, or even a parent can do the job. Assure your child the driver won’t talk, will let the teens pick the music, and can even wear a disguise if requested…(just kidding!). Driving your own child and their friends will probably keep you out way past your bedtime, but it’s a great way to know exactly where your kid is and that they are safe. If your teen gets a ride with a friend be certain to have the name, cell number and driver’s license number of your child’s date and the friends that will accompany them to the prom. Take time to share your expectations with the driver, and any passengers, about safe driving that include wearing seat belts and a zero tolerance for drinking, using drugs or texting when behind the wheel. Encourage your teen and their friends to eat dinner at a restaurant that doesn’t sell alcohol or one that doesn’t make a big deal out of their drink menu (which probably eliminates anything with “brewery” in the name). Offer to host a “five-course” dinner at your home for your teen and their friends. Whip up something fancy or ask everyone’s parents to contribute a dish to make it a potluck-style feast. Serve it on your fanciest plates, light candles, and then make yourself “there but not there”. Check out this 60-second video from local teens on how to throw a fun and safe party. Have a step-by-step itinerary for where your teen will be. If they decide to attend an after party at a friend’s house call the parents and confirm they will be there and no drugs or alcohol will be present. In a recent parent survey 51% of parents said they are “very likely” to call and check that parents will be present when their child goes to another friend’s house and only 29% of parents said they are “very likely” to check with the other parents to make sure there will be no alcohol or drugs available. It’s normal to feel a little awkward when calling people you don’t know but feel confident that most parents appreciate the connection and support in keeping everyone’s kids safe. Here’s a video with some ice breakers! Require that your teen check in with you at each location once they arrive and at regular intervals, and set a reasonable curfew. Let your child know you will be waiting up for them. Have the address and the telephone number of the after-party location, and prohibit hotel room after parties. The Seahorse Pride Organization is hosting a safe post-prom party, more info available through the school. Offer to host a post-prom-party sleep over and be prepared to supervise (discreetly, of course!). Take your kids to bowl after prom – everything is more fun in formal attire. Take your teen and their friends to an all-night diner for some greasy food and prom debrief (again, everything is more fun in formal attire). Sit at a different table and give them some space. Looking for more tips? Here’s a great article with even more info!